We are now opening Winter hours (from 1st October) which means we are closing on Sundays. We are proud to say that we are now licenced, for consumption of alcohol both on and off the premises. We have renewed our relationship with Laithwaites Wines and will stock a selection of their best sellers. Our ambitions are limited by space but we can obtain any Laithwaites Wine- usually within 48 hours if we have no stock of a particular wine. We have updated our tea room menu and as part of this process those who have the time for a lunchtime tipple will be able to purchase beer and wine in our lovely tea room as part of one of our delicious light snacks. We are also stocking local bottled craft beers- initially Hadrian and Border -but others will come along in time. 3 bottle gift packs are available. We also have an excellent range of local spirits, including 24 different local gins, Alnwick Rums, and Vodka from Durham distillery and Poetic Licence from Roker, Sunderland. Remember we are a click and collect store for Laithwaites. 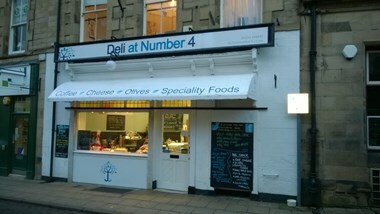 We are pleased to announce that following discussions with our good friends at Laithwaites we are to continue our relationship with them by launching a click and collect service from our Deli in Beaumont Street. 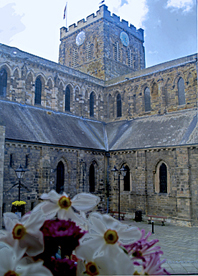 Simply go online at www.Laithwaites.co.uk to order your wine and collect from us in Hexham. We had over 300 click and collect customers at the Gosforth Garden Centre collecting almost 400 cases in 18 months- we hope to see our old customers soon and some new ones too!! 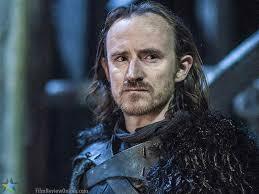 A recent visitor to the tea room was Ben Crompton who plays Eddison Tollett in the exciting TV series Game of Thrones. 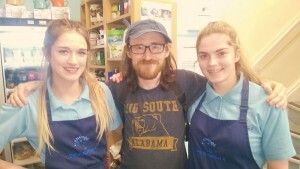 Ben was kind enough to pose with two of our staff- thanks Ben. Ben joins such illustrious visitors as Robson Green, Michael Murpugo, Alexander Armstrong, and Mike Harding who have all enjoyed their visits to the tearoom at Hexham. Copyright © 2011. My Web Online. All Rights Reserved.